Luminescent solar concentrator (LSC) is a device that has luminescent molecules embedding or topping polymeric or glass waveguide to generate electricity from sunlight with a photovoltaic cell attachment. 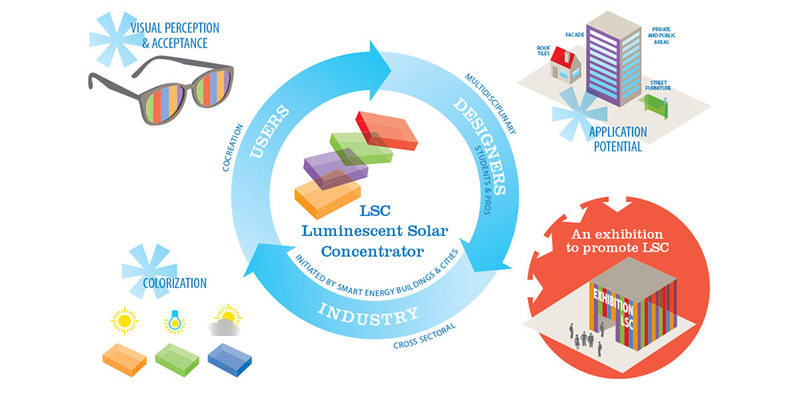 LSCs can be employed both in small and large scale projects, independent on the direction or angle of the surface with respect to the sun, promising more freedom for integration in urban environments compared to the traditional PV systems. The aim of the SEB&C PDEng project is to investigate the applicability of this innovative technology in the built environment and to bridge the gap of knowledge linking societal, design and technological aspects. The final goal is to exhibit potential application concepts of LSC developed by co-creative methods at SPARK campus which is a hub for open innovation in built environment. Necessity of a paradigm shift towards sustainable and smart cities came into being due to the significant increase in energy demand of the buildings. The challenge is to increase renewable sources in the energy mix while designing aesthetic environments. Thus, building integrated renewable energy technologies represent a great opportunity to help overcome this current challenge. Smart energy, energy efficiency and use of renewable sources are key aspects to be considered nowadays and many innovative technologies need further exploitation to be commercially viable, such as luminescent solar concentrator. TOSUN, Tugce. Luminescent solar concentrator. SPOOL, [S.l. ], v. 2, n. 1, p. 21-23, july 2015. ISSN 2215-0900. Available at: <https://journals.open.tudelft.nl/index.php/spool/article/view/946>. Date accessed: 26 apr. 2019. doi: https://doi.org/10.7480/spool.2015.1.946.